Pete Pagassi has been disgraced. After an addiction to the Explodz energy drink ruined his tennis career, the former world champion was forced into retirement and became a preschool tennis coach. But when Pagassi is arrested after trying to break into the Explodz warehouse, he is admitted to rehab in an effort to kick his addiction for good. Now recognising that the company ruined his career, he now swears revenge on the evil energy drink corporation. Tennis in the Face is cut from the same cloth as King Oddball but where one had you chucking rocks at military forces with your tongue, the other hands you a tennis racquet to slam tennis balls hurtling in the direction of your Explodz-addicted enemies. It’s no Wimbledon, but players are challenged to uncover the location of the Explodz factory to free Oddington’s people from the drink’s chaotic control. That will see you fight your way through levels that are spread across the Oddington Metro Map, taking down clowns high on Explodz that are harassing visitors at the circus, riot police that are sent in response to your attacks, hipsters that think that glugging Explodz is on trend, and Explodz Inc. factory workers that are dressed in protective hazmat suits. 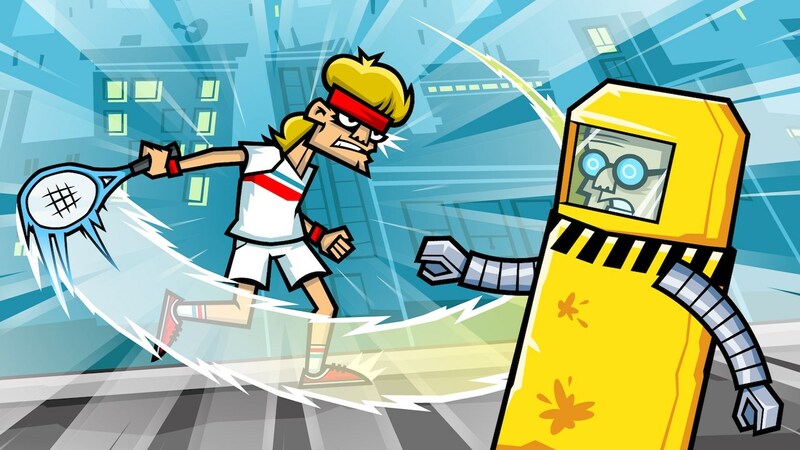 With the levels in Tennis in the Face plotted on the Metro Map, players must conquer each to unlock the metro station that will let them travel to the next district. Their completion requires that the player knock out the static enemies that they are confronted with, puzzle design that continues to take shelter in the shadow of the globally popular Angry Birds. Each level sees Pagassi stood in one corner, and the player left to aim a reticle in whichever direction they want to whack their tennis ball. You can use the Left Stick on the Joy-Con (or Nintendo Switch Pro Controller) for this, and, as another game from developer 10tons with mobile origins, those that want to play in Handheld mode can opt to use touchscreen input, too. Once you are happy with where you have lined up your serve, you let it fly and sit back to watch it ricochet around the screen until it runs out of bounce. It’s that simplicity that lends Tennis in the Face broad appeal, and, especially compared to King Oddball, the developer throws more ideas at the player pushing you to rethink your approach between each district. Whether that be glass that breaks once hit but destroys your ball, heavy cubes of scrap metal with sharp edges, or tennis balls packed in pressurised containers that release when hit, the puzzles soon start to feel as mischievously laid out as those in Home Alone. Even your tennis balls are swapped out for cans of Explodz at times, the addictive substance shortly exploding after its metallic container settles. And then your enemies become more challenging over time too, with riot police carrying shields meaning that it’s easier to whack them in the back of the head, and the Explodz Inc. factory workers must be hit twice thanks to their hazmat suits. With in-game medals to earn and special levels to unlock, Tennis in the Face encourages merciless trick shots to smack multiple enemies in the face with a single serve. Headshots score you more points, naturally, and while there’s the chance to compete on the leaderboards, players will find more challenge in completing levels with as few tennis balls as possible to score themselves a crown. There are more than 100 levels in Tennis in the Face and while their bite-sized design playing is a perfect match for playing Nintendo Switch on the go, it isn’t long before your enthusiasm for slamming tennis balls into foreheads starts to waver. There’s no chance of rain cutting play short though, and those that keep their rally going are sure to find this quirky game entertaining.